Your Suite including a private garden and summerhouse for you to enjoy costs just £110 per night. A minimum of 2 nights stay. A 20% deposit is required to secure your booking and the remainder to be paid on arrival in cash. Here at Glanmor Garden Apartment we are happy to accept last minute/late bookings however a bank transfer would be required to secure the booking. 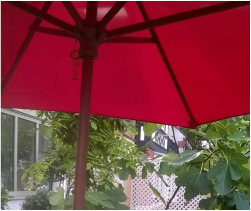 We place a large red umbrella so that we are easily spotted! ​Look out for the Red Umbrella ... See You Soon! When you make a booking with us we collect the names of all the guests who will be staying, along with an email address and telephone number of the person making the booking. We will only use your email address to send you confirmation of the booking and an email with more details on how to find us and other information you may find useful for your stay. It is kept securely by us during the duration of your stay and is not shared. Should you not wish to complete your details via the website contact form , you can also contact us directly. We do not store your data for future use nor do we use mailing lists. Feedback is valuable to us and to our future guests, many of our guests are delighted to write in our guest book and we really appreciate it. Reviews in our guestbook are viewed by other guests who visit and are also placed on our website and social media. Your details will appear on the website exactly as they have been written in the book. Should you at any time wish for your review to be removed from our website/ guest book/ social media please contact us.